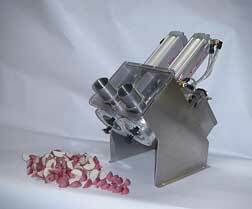 This stainless steel air-driven machine is made for B or C grade red potatoes . It wedges potatoes as fast as you can put them in the 2 loading tubes. About 120 potatoes per minute. This machine automatically drives the potato through the blade system for easy wedging. Includes blade and pusher blades—choose from 4", 6" or 8" Wedger Blades. Replacement Blades available.